This gorgeous Corfu Island wedding can be seen on Style Me Pretty here! From the Bride: “Many consider their wedding day to be a new beginning; the start of a new story. We saw our day as an opportunity to share more about our past – share our traditions, our backgrounds, our values. This was reflected in our invitations, which had personalized postage stamps of our parents and grandparents on their wedding day, our ceremonial Stefania (Greek crowns) that were passed down from my parents, and the drinking cup from my husband’s family. Our goal was to walk into the new cherishing the old, because, after all it made us who we are. 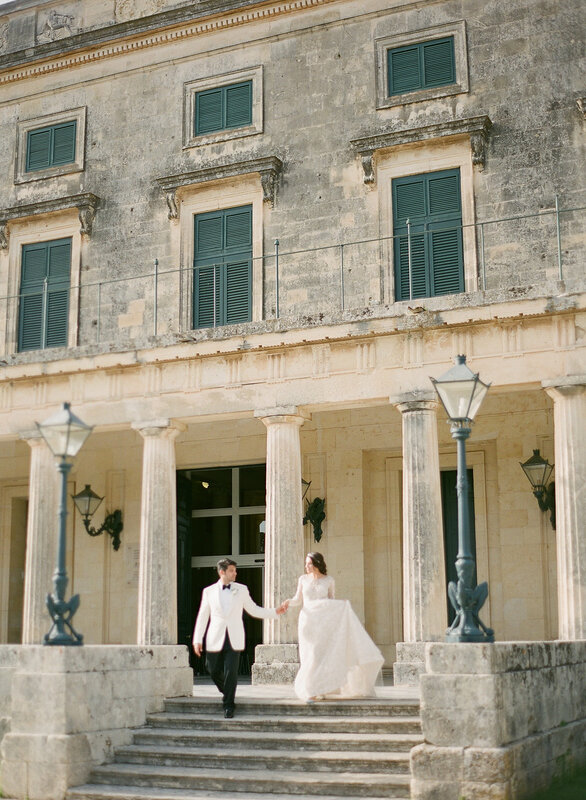 The Greek island of Corfu was the ideal location for us to do so– an emerald island on the Ionian, reminiscent of Venetian culture, giving an ode to my husband’s Italian background and allowing me to realize my dream of going back to the country I grew up in, to get married. Mediterranean cultures value family above everything else, something which was evident throughout the entire process. We shared with our families each step of the wedding process, irregardless the task. Whether the job involved making wax seals for each invitation or assembling gift bags and gluing a lavender flower to each name, we could always count on them. They were with us when we got ready, present when we became one, and walked down the streets of Corfu Town with us to commemorate our wedding.